Hatta: The late Shaikh Zayed Bin Sultan Al Nahyan and the late Shaikh Rashid Bin Saeed Al Maktoum were always larger-than-life figures in the building of a growing young nation. 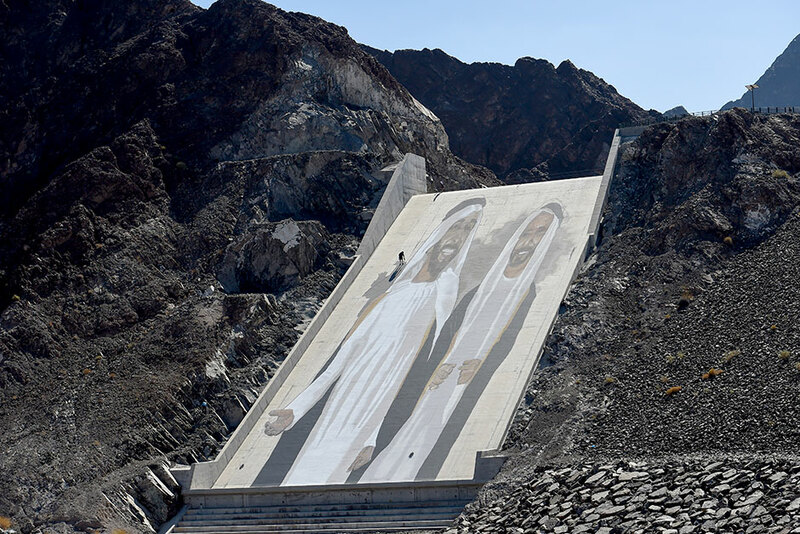 On Sunday, both central figures in the UAE’s formation in 1971 received more tall recognition when their portraits were unveiled in an 80-metre high legacy mural on the spillway of Hatta Dam 1. The spillway holds back the largest water reservoir in the country at Hatta Mountain Conservation Area. The mural of Shaikh Zayed and Shaikh Rashid. At 30 metres wide, the supersized mural was painted on a 45-degree exterior wall of the dam and is part of the Dh1.3 billion Hatta Comprehensive Development plan to breathe new life in the desert oasis’ economy, tourism and cultural sectors. The sweeping rejuvenation plan was announced by His Highness Shaikh Mohammad Bin Rashid Al Maktoum, Vice-President and Prime Minister of the UAE and Ruler of Dubai. The mural, meanwhile, received its finishing touches on Sunday after two weeks of arduous abseiling by its creator and world-renowned street artist Case MacLain of Frankfurt, Germany. “I am exhausted but I am happy,” MacLain told reporters at the foot of the mural in the midday sun, noting the steep angle made it very difficult to access and paint. The deep colours of the mural were painted using high-pigment paints that he lugged up and down the spillway and that will resist high exposure to sun. MacLain said he was honoured to be chosen for a project paying respects to two of the most important leaders in the UAE’s history since its founding. “I’m very appreciative of this opportunity to be able to paint such important persons,” he said. “The biggest challenge was how much material I could carry. If something dropped, it could drop on the wall,” said MacLain who is used to painting on large building walls. Mohammad Khalifa Al Kaabi, Senior Quality Service Officer at Dubai Municipality’s Hatta Centre, said everyone involved in the Hatta Plan is proud to be a part of rejuvenation of the area and seeing the completion of the mural project on Sunday was fulfilling. Al Kaabi said the mural is one of the latest initiatives under the Hatta Plan to add more to the conservation area. Mural in the spillway of Hatta Dam 1 at the Hatta Mountain Conservation Area, made by the world-renowned street artist Case MacLain of Frankfurt, Germany. Other new initiatives include a kayaking and boating rental service now operational on the 1.7-kilometre long artificial freshwater lake created when the Hatta Dam 1 was completed in 1997. The conservation area is growing in popularity and now receives 500 visitors a month. Getting the word out to visitors is the responsibility of Government of Dubai Media Office who has been charged with assembling a media strategy that informs the country’s residents of the Hatta plan projects. Hatta: All major agencies involved with the Hatta Comprehensive Development Plan said on Sunday that they are on track with their projects designed to make life better for the residents. Dubai Municipality has been working to boost infrastructure and support the plan through a number of measures, including holding the first Hatta Honey Festival earlier this year and developing the Sheraa Heritage Area. The nearby Hatta Heritage Village gives a chance to visitors to step back in time and have a look at the simple life of desert dwellers in a mountain oasis. The municipality is also working on what it has dubbed “Hatta Live”, which uses cameras installed at various places to broadcast 360-degree videos of the mountainous landscapes. The municipality’s new projects also includes housing for government employees, shops and playgrounds for children. The Mohammad Bin Rashid Housing Establishment has started work on the first phase to build 400 homes for Emiratis at a cost of Dh565 million. Dubai Electricity and Water Authority (Dewa) is in the planning and design stage for a 250MW hydroelectric power station that will tap into the Hatta Dam, a first in the Gulf region. A tender has also been awarded for the Dewa plan to bring solar power to 640 villas in Hatta. The Roads and Transport Authority (RTA) is involved in several projects including its Hatta Gate project to feature artwork to reflect Hatta’s character. The RTA is also building a major road, it said, to link Dubai and Hatta via Lehbab at a cost of around Dh55 million. More roads are being planned in Hatta by RTA at an estimated cost of Dh30 million. A raft of other projects are also in the works by Department of Tourism and Commerce Marketing, Dubai Culture and Arts Authority, Dubai Knowledge and Human Development Authority, Dubai Sports Council and Dubai SME.